Users love to return to their favorite websites. Often. They especially love them when they feel a connection to the design, the community and the owner. In my 11 years of experience as a web designer and blogger for both personal and business websites, I learned that there are certain winning elements for a website to engage its users, improve UX, create loyalty from new visitors and turn them into leads — or conversions. 1. Who’s behind this website? Users want to know who you are. They want to see your face. And — it might sound silly and counterintuitive — they want you to tell some anecdotes about your persona, not just your business and what you can offer them. If I want to hire you, refer you, recommend you, or even pass you some readers, I’ll feel more comfortable if I have some sense of who you are. I get that from two things — your writing voice and your photo. Needless to say that should be your real photo, not an avatar. Warning: Be careful not to go overboard with personal storytelling. In the end, the About Me page should still reflect your users’ needs, not be a short version of your autobiography. The SITS Girls offers great examples of About Me pages that work. 2. What’s in for me? No user comes to a website to pay the Webmaster a favor: They come to a website to look for something or to start a conversation with you. If the user stumbles upon a website that’s all about you and offers nothing to them, they’ll leave quickly. What if you run a personal site? A personal site or blog still offers something: an open door to your heart, thoughts and opinions, and an invitation to talk. However, if all you can offer is a monologue and you’re closed to communication, your site will stay a lonely thing. “I am in North Carolina and I need help on finishing the book. I will say my challenge mimics your example above” and then he quoted from a testimonial. While I do have a testimonials page, I always include testimonials right on service pages like http://thgmwriters.com/writing/ghost-writers/ and http://thgmwriters.com/writing/blog-writers/. Some people will chase down testimonials for reassurance, but placing them on the page they are visiting makes it easy for everyone to see that you can be trusted to deliver quality results – without them having doubts in the first place. Originality: don’t copy content or images. Related: the users has to find the piece of content related to what’s on their mind or what they are interested in so you have to survey and find what their needs are right now and try to meet them. Creative: be creative and try to stand out provide something different or discuss the topic from a different dimension. In addition, don’t state the obvious you need to research very well and find new information to add in your posts. Ethical: as said before, keep your ethics don’t endorse opinions or topics that would attract users regardless of their harms. Consistent: keep updating and provide content at somewhat steady rate which is hard for beginner bloggers nevertheless less is more it is always better to provide one-two pieces of great content per week than to provide many more with less quality. The important thing is to remain consistent because users will start to wait for your posts and you don’t want to disappoint them for sure. Engage: maybe you would like to ask users about their opinion always and adapt further posts accordingly. Real: provide real advice and solve problems realistically don’t just provide any solution for the user, be sure that what you are suggesting is real and applicable and the advice you are providing is the one you yourself would apply in real life. Organized: keep your content organized and easy to access whether new post or old ones. In addition for every post make sure it is divided into sections and subtitles maybe use points or numbers don’t just write big chunks because this would make the user feel lost between the lines in addition mobile version things will look even more unorganized. Users want to be invited to do something on your website. Not because they want to be spoon-fed, but because they may feel lost or just unsure of what to do next. There are actually two CTAs here: the first is an invitation to the reader to download a free Social Media guide; the second is an encouragement to leave feedback on the article by means of blog comments. CTAs (Calls to Action) come in handy. Co-blogger Lori Soard wrote an in-depth case study about what successful CTAs work and how they can help you increase feedback and conversions. Don’t know where to find copyright-free or creditware images to use with your posts? Our Jerry Low wrote a wonderful post with 20+ resources you can get tons of images from. My personal favorites? FreeDigitalPhotos.net and Compfight.com. Follow CopyBlogger’s advice on how to make your website mobile friendly (psst, you or your designer— start with adding easy responsivity via viewport tag). When your visitor hits a non-existent page, the server will throw a 404 error to your browser and it will display it as an HTML page. You want something like this! Your users want to feel guided back home when they lose the way. 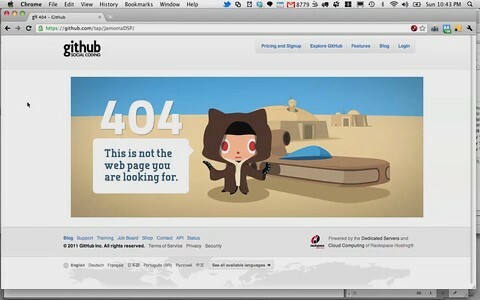 Your 404 page should offer a brief orientation guide and get them back on the right path. When done creatively and with purpose, a 404 page can not only retain the visitor but make her hang around and check out what else is going on around your dot com. You should go read her advice. Lori takes several examples into account. Offering forms to convert visitors into subscribers or customers should be a simple and uncomplicated process. “Make sure your forms have as few fields as possible.” Advises Samuel Scott, digital marketing and communications consultant. Your top navigation menu is the first “orientation guide” your users will see and follow— and you can win or lose them there, depending on how you play this essential UX element to your advantage. I opted for a simple CSS and HTML5 dropdown menu with only the essential pages that define my website; other pages went in submenus or other links scattered throughout the website, in posts, pages and forum threads. Yes, we did this once through our Facebook fan page and the responses were very satisfactory. The responses we got were cheering our performance and this is because we focus on getting content ideas from the users in the first place. We keep an eye through online communities on what the users are talking about and then we provide content that solves or informs about the subject and so the response we got in that mini survey was positive. Also we receive suggestions on our Facebook page about topics we should discuss and testimonials about what users liked also keep us informed about what we should focus on more. We had a client who wanted to have a poll/ quiz on the technology advances in diabetes. The quiz was successfull and we set it out with simple one word answers and yes or no options. The difficulties we found was getting people to do it. We have a large audience base of 25,000+ and only managed to get a small intake of people who took it (and this is even with offering a free smart watch to the winner). However, you shouldn’t give up. Once your users realize what’s at stake and what a crucial role they have in helping your website grow, they will get more responsive to your polls and surveys. A well-built website separates content from presentation and makes it easy for text-only browsers to parse documents without the added issue of image placeholders scattered all over the place. Keeping the two elements separate also helps to make pages load faster, because graphics, inline CSS and scripts add a lot of weight that users on slower connections can’t afford to wait for. How to separate content and presentation? But don’t be a grammar-Nazi! Users won’t mind what’s generally considered awkward sentence construction if it’s helpful to the goal (copywriters do this all the time). So watch your grammar, but give it a break (you can use sentence fragments occasionally). Whether you write sponsored posts or you seasonally promote helpful products for your users, you should always disclose whether a piece of content or a product is paid for or not. In a heavily commercialized Web, it’s easy to mistake a genuine post for an addpvertorial and vice versa. In the US, FTC (Federal Trade Commission) made disclosures mandatory for advertisement of any kind and you should keep it mind even if you’re not based in the US but you regularly get users or buyers from the US. Honesty is disarming for users. They’re gonna love you. When your users find your content interesting, their focus will be absorbed completely by only that — your content. That’s why you should add a conversion form right after your content has ended. Possibly, you should connect it with the post’s own CTA. After your user has consumed your content and she found it satisfying, she will be much more receptive to anything you’re going to offer her. Welcome their feedback and put it in practice. Mention your users often. Thank them publicly for their help, suggestions and loyalty. For the most part, visitors are extremely excited about having the opportunity to share their ideas and work with others because they value the advice and criticism given by those in the same boat as they are in. Who wouldn’t react positively if given the chance to brainstorm 24 hours a day, seven days a week, every day of the year? Also see Element #12 about polls and surveys. Some business owners, like Carol Tice from Make A Living Writing, discourage the use of a contact form and prefer a simple email address that prospective clients and readers can grab and message to. Others prefer contact forms over email addresses and their users are fine with the choice. If your website is a lead generator, make it so easy to contact you that you don’t miss any leads. In my case, I want contact by form, so I have a floating form on all pages of Thgmwriters.com. Even on the blog, I have the form, although it does not float there. If you want contact by phone, include your phone number at the top of your pages, maybe even in the banner. This is a tactic we used when redesigning Paramount-Roll.com. In fact, you will see three direct contact calls-to-action at the top (“Contact us”, “Request a quote” and “Call us for a free quote”) followed by two information pieces that we know often precede a request for a quote (“Samples of our work” and “Download our brochure”). All five direct and indirect contact prompts are near the top of the page in the upper right hand corner. Plus…the phone number and a link to the quote form are near the bottom of every page, too, so that people reading below don’t need to search for contact information. [I]t is important to keep the visitor in mind. If you want to make your website or blog as attractive as possible, keep the viewer in mind. Use simple, easy to navigate themes when called for. This is especially important when the website is designed for eCommerce. If certain elements like order forms and shopping carts are difficult to find, visitors will jump back to the search engine rather than hunt for what they are looking for. My best advice would be to hire a web development company, expenses permitting, to design a site that targets your particular audience. If you are unable to do this, choose a theme that is simple and easy for visitors to find their way around. That is what attracts/engages visitors above all else – accessibility. Here’s my rule of thumb: Build, promote, and publicize a website that delights its target audience, and everything else will fall into place. But how do you that? First, you need to do audience research and develop a buyer persona. What does your target audience want, love, hope, and fear? What is their generational and demographic profile — female senior citizens and teenage boys, for example, will respond to different marketing messages. Say that you are a mobile-monetization plat­form that helps peo­ple to make money from their mobile apps and games. What can your web­site give that will delight mobile devel­op­ers? What Do Peo­ple Want in Mobile Apps? How Much Money to Dif­fer­ent Mobile Games Make? For more to read, I also wrote an article on audience assessment for WHSR in 2014. I have two contradictory pieces of advice: make it load fast and use multimedia. By use multimedia, I absolutely mean to include images, but also to include video as much as possible. But let me be very clear – video does not replace text. Some people prefer video, because they can listen while they do other things or they just feel more entertained. Others prefer text because they can easily scan through for the useful stuff. Either way, the walls of text we are used to in books just won’t work on the Web. Use headers, bullet points, images, designs and video to break up the text and give readers a richer experience. But make sure the pages load fast, or readers will never see your pretty pictures, only the “back” button on their browsers. [T]he biggest mistake web designers and bloggers make is to focus too much on aesthetics and not enough on accessibility. It’s great to have a website that is lovely with sliding banners and amazing graphics but if visitors can’t find their way around because it is too busy, well you’ve just lost a sale! The most important concept to keep in mind is that many of your visitors are not techies. They are just plain, ordinary people looking at your product, service or information. Keep your site attractive and engaging, but make sure it is easy for them to find what they are looking for. In this case, more is not always better. A site that is easy to navigate is one that will provide the highest rate of conversions. To make content fruition easier for your users with Dyslexia, UXBooth has two articles about it, and David Ball wrote an interesting article in 2013 on what he found out about website UX when he pretended to be blind for a week. You can poll your users to find out if they have other accessibility issues, either health- or tech-related. See Element #12 for polls and surveys. Okay, even Google Analytics and Piwik use tracking scripts, as well as social buttons, but your users’ privacy is important, so you should work on minimizing the number of tracking scripts you’re using on your website. If you’re unsure of which tracking scripts you’re using, you can install the Ghostery plugin on your browser and visit your website— the blue ghost icon on your menu bar will tell you what trackers your website is actually running. See Element #24 for cookies. In addition to working with your designer on this aspect, you can use the following tools to analyze your website and see which elements can be blocked without ruining UX. You can get inspired by mobile UX, if you like. Cookies are invasive for the end user. They are small pieces of data (sometimes saved as text files on your browser) that only look innocent at first glance, but they can turn out to be a serious threat to the user’s privacy and security if handled incorrectly. Are you still using popups? If you do, it’s time to rethink your strategy. Your users come to your website looking for information, and they won’t focus their attention on anything else until their task is complete. Once they feel satisfied, they will be more keen on spending some additional time on your website and look at your offers. But popups interrupt them, frustrate them and push them to leave before they actually get to read your content. Use modal dialogs and notification bars instead of popups. They are less obtrusive, they convert well and users can hit ‘close’ when they don’t need them anymore. Color psychology in web design counts. Human beings associate colors with emotions and they can have different effects on the chemistry of our body. You should use colors to your advantage in user engagement. Your website colors should reflect the emotions you want your content, design and message to convey to people. Don’t use red extensively if you want to communicate zen-like peace and relaxation. Instead, use light blue and opaque green. Gone are the days when small to tiny fonts were considered the top of web design aesthetics. If you want to keep readers on your website, you have to accommodate their need for readability and accessibility (see Elements #19 and #21). Also, it has been scientifically proven that small fonts on both mobile and desktop cause eye strain and strong headaches. You should only use small fonts on fine print (and even that, make it not-so-fine, please). Remember, you should design for readability, not for aesthetics. I already mentioned in Element #1 that you should use anecdotes and storytelling in your About Me page. However, storytelling doesn’t stop there. It’s proven that users are attracted to true stories because they add trust to your content, and your efforts are more likely to lead to conversions when you use them. Your true stories must be true, though! Don’t fake it. People can tell or find out. Besides the fact that ads above the fold are NOT more viewed than other ads, you have to understand a user’s psychology. Your user comes to your website looking for information. She won’t care about anything else but the information she’s looking for. After she consumed the information and her heart is at peace (bottom of your content), she will have more time to browse around your website. And that’s exactlywhere you should show her your ads. Like with conversion forms, you have to play along with your user’s needs. Satisfy her needs first. Then, you can tell her about the wonderful offerings your advertisers have reserved for her. Trolls, spammers and scammers can break the community built around your website and its content. Users can feel threatened by these people and leave your website forever. You don’t want that. Unless you can find a way to turn these users into ‘good citizens’, you need to protect the pool of good users from the hecklers. Monitor UGC — especially comments and community posts — and block or ban any trolls and spammers you find out acting as mischief-makers. Some webmasters still do, but image buttons are heavy to load for users and they slow down overall website loading. Image buttons used to be a workaround years ago when HTML5 hadn’t been released yet and there was no way to vary button shape. Also see Elements #13, #20 and #34 in this article. In addition to your already free-to-read content, you can offer other freebies that will put you under a good light for the user. Free consultation, guides, e-books– anything that can show them you’re not greedy and you care. However, you should watch your freebie ROI closely to monitor your success rate and you can use these 4 strategies from Sherice Jacob at KISSmetrics to turn your freebie users into paid customers. Also see Element #2 for why you should give to your users. Subscribers are your loyal elite and you should make it feel important. Because they are important— to the well-being of your traffic and conversions. The longer your subscribers stay subscribed and loyal to your content and products, the more you can count on them as your main conversion platform. How can you ‘spoil’ your subscribers and keep their loyalty intact? User experience for subscribers translates into listening to their needs, responding to their queries and welcoming their suggestions (or, if you can’t do that for any reasons, be responsive and provide them with an explanation, still thanking them for their efforts). Bring content, offers and ideas to your subscribers that they’re unlikely to find elsewhere and that motivates them to stay subscribed, because that’s exactly the information they were looking for. But never ever ruin UX to try to get more subscribers! CopyBlogger shows you how to increase your subscription rate by 254% without screwing it for your users. Webmasters usually clutter their sidebars with ads, banners, widgets and social media buttons. But do you know what happens? That sidebar will be so heavy that it’s going to slow down loading for the entire website, and when it finally loads, it will give your users a headache. I’m sure you don’t want that. Keep your sidebar clean, uncluttered and to-the-point. Add your short bio, a few social buttons, links to your most popular posts and perhaps an ‘As Seen On’ info box. Reduce graphics to the bare minimum and avoid ads and banners at all costs (see Element #29). A great sidebar example? Neil Patel’s blog sidebar. A community makes it possible for your users to interact, debate and work together to promote your content. Any brand, startup and webmaster would benefit from focusing their non-content and non-design efforts on community-building. If you haven’t taken this element into account yet, I encourage you to read this enlightening post Mashable. If you want to go deep into community building and involve your users in participation, teamwork and moderation, you can download and read Jono Bacon’s The Art of Community from his website ArtOfCommunityOnline.org. This is a 574 pages e-book released under the Creative Commons Attribution ShareAlike Non-Commercial license. For the love of all that’s holy and beautiful, don’t close comments on your blog posts, articles and news pieces! You may think blog comments are a waste of time and rely on social media accounts like Copyblogger did, but not every visitor utilizes social media and some readers leave in frustration when they can’t find an immediately way to send you feedback on a post — and perhaps see their post approved publicly, too, so they can discuss with you and other commenters. At the same time, you should go out there and comment on others’ blog posts, because they will likely reciprocate. Andrew M. Warner published a great case study on how blog comments helped him boost engagement by 1583% for his Shade of Info blog. I encourage you to read it. All of this because I made a conscious effort to build relationships with other bloggers — and it was paying off. Bottom line: Blog comments are important. And as good as social shares can make your blog post look, if you don’t have a substantial amount of comments, or any comments at all, it doesn’t have the same impact. User Experience is more important than anything. There is no point getting people to your website if they are going to bounce off straight away. Be willing to invest time and money into optimising your website and making it a two step process for your audience to get to where they want to. Be true to yourself. Write what your audience want to read. Scrap the Jargon, dont duplicate other’s post and give your honest account on it. People love honesty and opinions and they are engaging. You can start debates around peoples opinions, you cant start debates around regurgetated content – and it isn’t good for your SEO either! What do you do to ensure user engagement on your website? Luana Spinetti is a freelance writer and artist based in Italy, and a passionate Computer Science student. She has a high-school diploma in Psychology and Education and attended a 3-year course in Comic Book Art, from which she graduated on 2008. As multi-faceted a person as she is, she developed a big interest in SEO/SEM and Web Marketing, with a particular inclination to Social Media, and she’s working on three novels in her mother-tongue (Italian), which she hopes to indie publish soon. WordPress vs. DIY Website Builders: Which One Should You Use?